To create employment during the Depression of the 1930s the Government sponsored a scheme to divert the outlet of the Harvey River into the sea near Myalup and so reclaim land for agriculture by reducing flooding downstream. 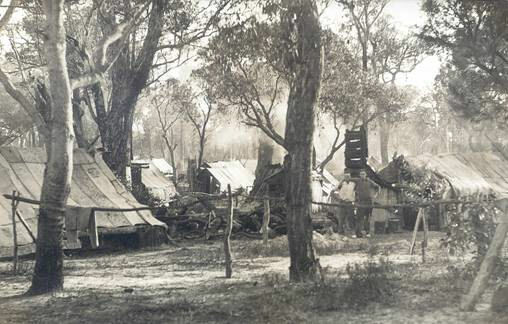 Some 2,500 men working on the project were camped west of Harvey and, at times up to 3,500 lived in camps at Myalup and the nearby Stonehouse. A mechanical drag operated at the Harvey end where the earth was heavy clay but further west shovels and wheelbarrows were used to move the sand. Each man worked two days a week for a ‘sustenance wage’. They paid out one shilling per week for tent hire and about one pound and fifteen shillings for food, leaving them with perhaps ten or fifteen shillings. Workers cooked for themselves on an open fire and with a lot of idle time on their hands, many took up fishing to augment their food supply. Others joined the constant gambling that flourished in the camps. The scheme, funded by the Federal Government was under the control of the Public Works Department and in those desperate times, no further funding was available. The Depression bit deeper everywhere and the Minister for unemployment Jack Scadden was under constant pressure on all sides. Heavy immigration from the United Kingdom in the 1920s and the collapse of farming ventures enhanced the numbers of unemployed. The Harvey Scheme was just one of many undertaken by the Government through the Depression years, in an attempt to create employment. In 1931 the site was cleared for the Canning Reservoir and the necessary roadworks done into the catchment area for what would be part of the metropolitan water supply. The pipeline carrying the Goldfields water supply was repaired and constantly maintained and more men were employed on the Waroona Dam. All these works were of benefit to the State’s South West; more good agricultural land was drained in winter and irrigated in summer. The dairy industry expanded as an estimated 76,000 acres was irrigated. When work began on schemes such as these, an estimated one third of the State’s breadwinners were unemployed. Of the remainder, many worked only part time. Officially, unemployment stood at 11% in 1929 and rose to 30% by 1932. In the years of 1931, ‘32 and ‘33 most of the State’s budget was spent on public works as a way to ease unemployment. A memorial to the men who worked on the Harvey Diversion and Drainage Scheme stands in Stirling Park, close by the Diversion on which they laboured. Notes taken from a pamphlet available at Harvey Tourist Bureau, and others. They loaded us aboard a train and took us to Harvey. Life was tough, we were pushing wheelbarrows up 6 inch plants as we dug the Diversion to the sea. We worked 2 days, all a single man was entitled to. If we worked any more and were caught, we were refused work for a fortnight. We earned 12/7d and were charged 6d a week tent rent; there were two to a tent. Charlie Coughlan was my tent partner. We called ourselves husband and wife because we lived together. Dave Bell, of Bell Bros was there. They got started with horses and drays. Dave did the pile driving on bridges. Each man wore a dog medal around his neck with his name and number. We produced that so expenses were taken out before wages were paid. Mr Pinner, a bookmaker of Harvey, had agents at Myalup and Stonehouse who were paid commission when we tried to increase our finances. Fleas were a menace; each morning we hung our blankets on the line and killed them between our thumbnails. ‘Insectabane’ powder made them worse, just made them savage. Further information: Alan Stimson describes life in the camps and as a shop assistant at Stonehouse camp on the CD ‘Digging the Diversion’ available from Harvey History Online. Further reading: Geoffrey Bolton’s A Fine Country to Starve In describes the Depression years in Western Australia. In the chapter ‘The Anatomy of Hardship’, Myalup and Stonehouse camps are featured.